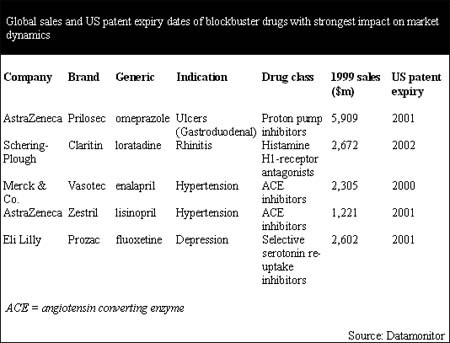 Eighteen current blockbuster drugs will lose their patent protection in the next five years. This will affect $37 billion worth of the current $300 billion ethical pharmaceutical market. Some of these patent expiries will impact entire therapy areas, particularly when single drug classes become exposed to generic competition. Already by 2002, the patent expiry of five current blockbusters could leave a gap totaling $14.7 billion in the combined revenue stream of four pharmaceutical companies. These five blockbusters are AstraZeneca's Prilosec (omeprazole) and Zestril (lisinopril), Schering-Plough's Claritin (loratadine), Eli Lilly's Prozac (fluoxetine), and Merck & Co.'s Vasotec (enalapril). Over the next 2 years, the hypertension, ulcer, depression, and rhinitis markets will be most affected by patent expiries. Companies rally to protect patents—but some drugs are facing additional challenges. During the next 2 years, the hypertension, ulcer, depression, and rhinitis markets will be most affected by patent expiries. For generics companies, the years until 2005 look extraordinarily promising. Not only are, in total, $100 billion of patented pharmaceutical revenues being exposed to generic competition, but there are also many high-selling individual products waiting to lose patent protection. High-selling products, including blockbusters, provide particularly popular targets for generic competition. Since they target large patient populations, the volume sales potential is high. In relation to this, cheap generic versions can cut overall treatment costs and so are attractive to healthcare payors. By 2002, the patent expiry of only five current blockbusters could leave a gap totaling $14.7 billion in the combined revenue stream of four pharmaceutical companies. These products are among the highest selling drugs ever. In the years 2000–02, the patent expiry of AstraZeneca's Prilosec and Zestril, Schering-Plough's Claritin, Eli Lilly's Prozac, and Merck & Co.'s Vasotec will impact the dynamics of entire drug classes and, therefore, the dynamics of entire therapy areas. According to Datamonitor's analysis, the four markets that will be most strongly affected by the patent expiry of blockbusters are the ulcer, rhinitis, depression and hypertension markets. Prilosec's patent expiry will free up $5.9 billion to generic proton pump inhibitors, Claritin $2.7 billion to generic anti-histamines, Prozac $2.6 billion to generic selective serotonin re-uptake inhibitors (SSRIs) and Vasotec and Zestril $3.5 billion to new generic angiotensin converting enzyme (ACE) inhibitors. The sales performances and patent expiry dates for these products are shown in the following table. While generics companies are preparing for the launch of cheap versions of high selling branded products, pharmaceutical companies are fighting to maximize the protection of their key revenue generators. There is a range of different strategies that companies can employ to extend patent life and minimize revenue loss of important products. In Countdown to Patent Expiry, Datamonitor has identified five major types of revenue protection strategies: maximizing regulatory benefits, adding value to product through new formulations and indications, defending patent rights, competing post-patent expiry, and conducting lifecycle management. The more important a product is for a company's revenues, the more of these strategies are generally used. In the case of Prilosec and Claritin, AstraZeneca and Schering-Plough have already exhausted most of the possible options for patent protection. Schering-Plough, for example, has continuously launched new formulations of Claritin. This has driven sales of the Claritin family from $795m in 1995 to $2,672m in 1999, representing a CAGR of 35.4%. In addition to a recently granted six month pediatric extension, the company is also seeking regulatory extension to Claritin's basic US patent, which is due to expire in 2002, until 2005 on the grounds of delays during the original approval process. Similarly, AstraZeneca's patent protection strategy for Prilosec is very comprehensive and exhausts nearly all options available. It has built up a tight fence around Prilosec through new formulations and indications, which protect specific aspects of Prilosec's production, formulation and use for 13 years beyond the basic patent expiry in 2001. 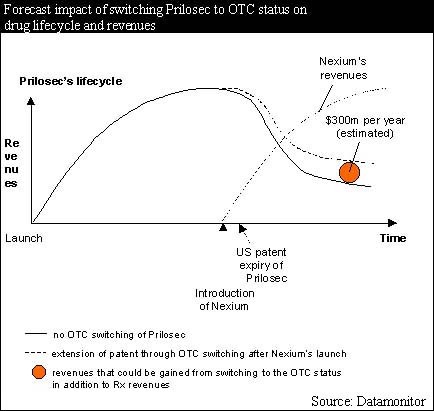 In addition, the company is aiming to establish Nexium (esomeprazole) as an improved follow-up to Prilosec. It hopes to maintain its market share by persuading physicians to prescribe the new product before cheap generic omeprazole becomes available. Datamonitor believes that a further opportunity lies in switching Prilosec to OTC status, which could potentially result in an additional $300m in revenues per year. This is illustrated in the following diagram. Lilly's patent protection strategy for Prozac has recently been given a blow with a US court decision confirming the drug's patent expiry date as 2001, rather than 2003, which Lilly was gunning for. This was one of Lilly's last chances to save Prozac from generic competition. It has already exhausted a relatively wide range of revenue protection measures for Prozac. These include line extensions in the form of once weekly formulations, and additional indications such as premenstrual dysphoric disorder, as well as the development of a follow-up, r-fluoxetine, in collaboration with Sepracor. Moreover, Lilly has a promising successor for Prozac in its antipsychotic Zyprexa (olanzapine), for which 2000 sales have already exceeded $1 billion. Ultimately, the success of any patent protection strategy will depend on the specific market dynamics at the time of patent expiry and beyond. This is particularly true in disease areas in which innovative treatments threaten the sales of market leaders, irrespective of patent expiry. The hypertension market is a good illustration of this, with the ACE inhibitors, such as Zestril and Vasotec, now being superseded by the newer angiotensin II receptor antagonists (AIIA). Therefore, Merck & Co. has only sought a relatively straightforward six month pediatric extension for Vasotec, for which sales declined by 4.0% in 1999. Instead of investing in other expensive patent protection strategies, the company is mainly focusing its cardiovascular marketing efforts on its AIIA Cozaar (losartan), because of the higher growth potential in this newer market. For more information, contact Elisabeth Overend-Freeman of Datamonitor at 212-686-7400 ext 765 or efreeman@datamonitor.com. Click here for more industry analysis from Datamonitor.